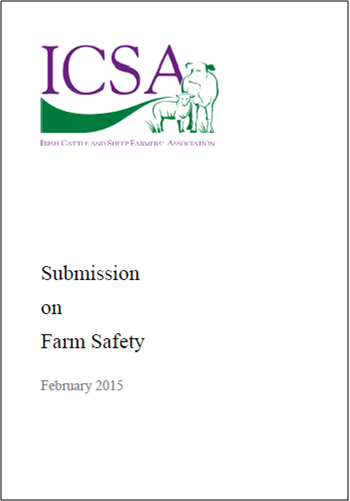 In March, ICSA made its submission to the Department of Finance in response to the Agri-taxation Review consultation. 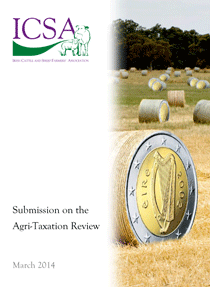 The purpose of this review is to analyse the benefits of the various tax measures to the agriculture sector and the wider economy versus the costs, i.e. value for money to the economy. 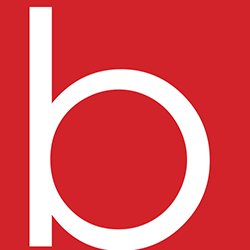 Submissions received by the Department will be considered in the context of Budget 2015, which will be brought forward this year into August. 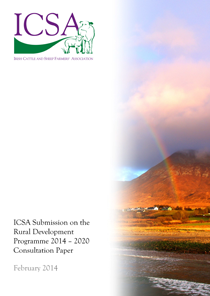 ICSA made a submission in February to the Department of Agriculture, Fisheries and Food in response to the 2014 – 2020 Rural Development Programme 2014 – 2020 consultation paper. 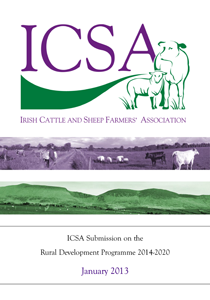 Key overarching themes of ICSA’s submission relation to appropriate targeting of RD funds, simplification of application and record keeping, cost implication of capital measures, equitable division of sectoral budgets and focused measures for suckler and sheep farmers. ICSA expects to continue to lobby strongly in support of the drystock sector as part of RD negotiations through the course of 2014. 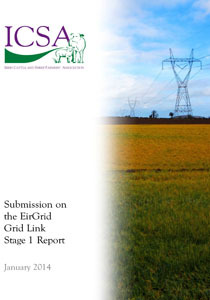 ICSA has submitted its consultation response to EirGrid’s Stage 1 Report for the Grid Link project. In principle, ICSA acknowledges the importance of reinforcing the national grid and of facilitating a more sustainable domestic energy supply through the development of renewable energy generation schemes. However, under consultation with its members, ICSA has noted that there are significant concerns amongst rural communities in relation to the extent and proposed technologies of the Grid Link project. ICSA wises to highlight the overall lack of reference made to farming in EirGrid’s report, particularly in the context of farming being the predominant land use along all of the proposed route corridors. In its submission, ICSA is strongly advocating that all parties involved in the Grid Link planning and design process take this opportunity to revisit the proposed engineering options, taking into account recent advances in technology which may more readily facilitate a more widely acceptable undergrounding solution. ICSA is additionally calling for a full Cost Benefit Analysis of the various engineering solutions. Furthermore, ICSA is advocating more comprehensive assessment and more balanced communication of potential impacts to rural society and the agricultural landscape. 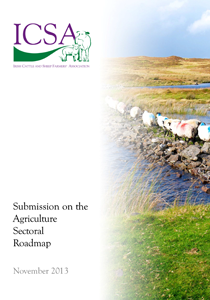 ICSA made a submission in November 2013 to the Department of Agriculture, Fisheries and Food in response to the consultation regarding the Agriculture Sectoral Roadmap of the draft Climate Action and Low Carbon Development Bill 2013. Much more precise analysis is required to establish what agriculture has to do to meet climate change targets and how this can be achieved in practice. Further clarification is required as to what constitutes emission reduction for each agri-sector. Following from this, there must be a clear vision of a regulatory and policy framework so that farmers have a transparent reference of how they can farm in a viable way while playing a feasible part in the climate change effort. 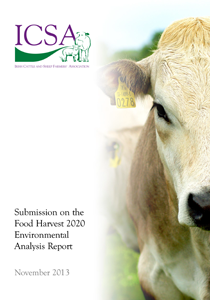 ICSA made a submission in November 2013 to the Department of Agriculture, Fisheries and Food in response to the consultation regarding the Food Harvest 2020 Environmental Analysis Report. General comments are also made regarding the recommendations of the Environmental Analysis Report. Minister Coveney recently made a call for submissions on Dog Microchipping as part of the passing of the Animal Helath and Welfare Bill into law; he specifically plans to introduce a regulation which will require the microchipping of all dogs in the country. ICSA aim to play an active role in any publicity campaign during the microchipping rollout. The Department of Agriculture sought views from the main farming stakeholders on the potential content of a new Targeted Agricultural Modernisation Scheme for the suckler sector. 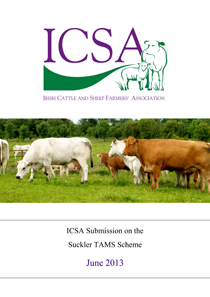 The Suckler Committee reached a consensus that the most appropriate use of funding for a Suckler TAM Scheme would be to prioritise improving farm safety and welfare through modernised animal handling facilities. 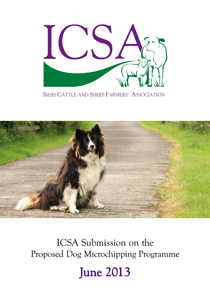 Through these measures, ICSA believes that we can advance the competitiveness of the suckler sector, whilst improving the overall health and genetic resources of the national herd.